I am the current Editor-in-Chief for The Louisville Cardinal and hold the titles of Director of Marketing and Recruitment for The Ville’ns. Men’s basketball kicked off the very first game of March Madness in Des Moines, Iowa. Members of The Ville’ns Executive Board were invited to join the fun by the athletic department. If you have not been to any athletic event in the last three years, or actively follow University of Louisville Athletics, The Ville’ns is the official student section of U of L.
Wednesday we kicked off the Nine-and-a-half hour drive for the ultimate fan experience. Our midnight arrival was welcomed with parking alongside the team bus and staying at the team hotel. Cardinal decals were on all doors and several portions of the lobby. Staff wore the ever-so-stylish “Welcome to the Ville” t-shirts along with other red and black attire. Local sports media members, parents, players’ family members and Bill Murray, the best fan in college basketball, were also at the hotel. March Madness banners were plastered all over the city skywalks and hotel room keys. The lobby wall was covered with a full bracket. After a three block walk with fans from across the nation, there we were. We were just five college kids a few rows behind our student athletes and Bill Murray who was somewhere in the front row mixed in with the Cardinal family. Fans from all over wore their team gear while taking in the raw reality that we were about to experience the NCAA tournament live. 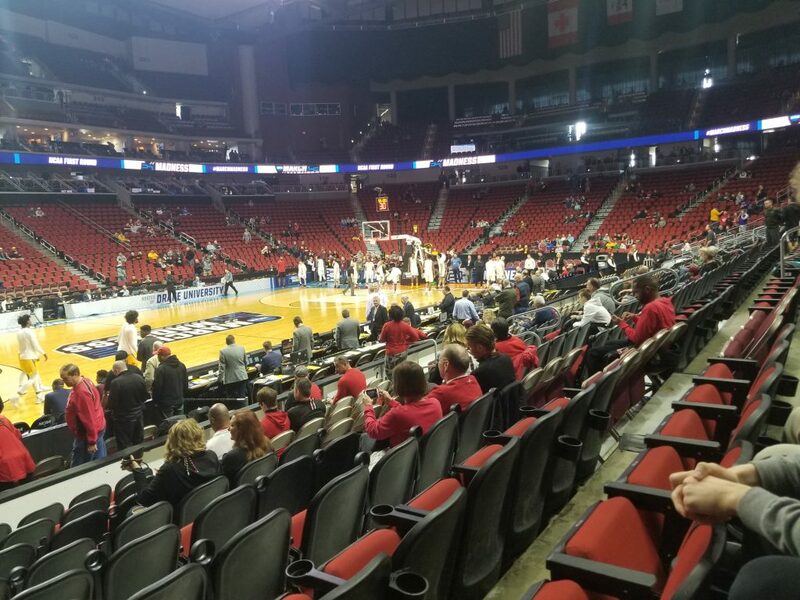 The Wells Fargo Arena was a tight squeeze with a capacity of only 16,110 seats, reminding us of how spoiled we are with the KFC Yum! Center and its 22,090 capacity. Few things will ever be more satisfying than receiving texts from friends and family saying they heard your battle cry while a Minnesota player was up for a free throw. I live for the moments when my voice is recognized as being the loudest in a room, let alone in an arena with over 16,000 fans. “It was an incredible experience that I wouldn’t change for the world. I’m incredibly grateful for the opportunity presented for us to us, but I wish we could’ve come home with a win,” said Ville’ns President, Andrew Wiemels. After an exhaustive season of highs and lows, there isn’t a group of people I would rather have traveled to see. Our team had the heart and drive to surpass all expectations this season, making it to the tournament despite the consistent negative media attention. Team 105 will forever hold a spot in my heart. While I wish I was able to watch them advance further, I will remember how I got to watch them grow to the team that showed the world the holes in Duke and UNC.